* Certified Jeet Kune Do Instructor JKD Assoc. * Awarded "Instructor of the Year" March 2000. * AHF Inducted to Hall of Fame "Best New Organization" 07. Master Ehnle Demonstrates a defense against two attackers. There are no defined standards within the Martial Arts industry for instructors. Unfortunately there are instructors who can just purchase fraudulent instructor credentials. It is up to each individual school to determine the qualifications of an instructor level position. Our standards at Royal Dragon are extremely high out of respect for the great responsibility of teaching these ancient Martial Arts skills to the next generation. 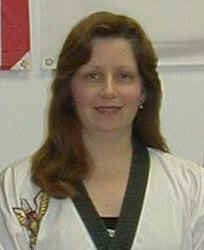 Our entire staff consists of highly skilled Martial Artists who earned their instructor positions from their instructor. There are no corporate "purchased instructor credentials" in our school. Each instructor earned their position the traditional way. 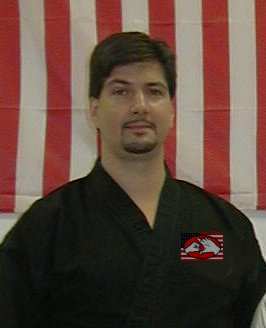 Each instructor is an adult with at least a 4th Degree Black Belt. We have no teens or children teaching class. Our Dan ranks truly represent years between Black Belt ranks and not hollow purchased rank with the minimum time in grade. Only the finest Martial Art Student who demonstrates excellence in physical, mental and social skills can earn an instructor position at Royal Dragon Martial Arts. Come witness a class and meet our traditional and highly skilled staff, you will see the difference. Instructor Annette Ehnle Demonstrates a Front Kick.